Middle School Teachers Only Gives Students TWO BATHROOM BREAKS A MONTH?! A month is a real long time to hold in some pee. A middle school hall pass that restricts bathroom visits to two per month has gone viral, bringing controversy to a charter school in Memphis, Tennessee. In late August, a student at Aspire Hanley Middle School brought home a strange document handed out by her teacher. 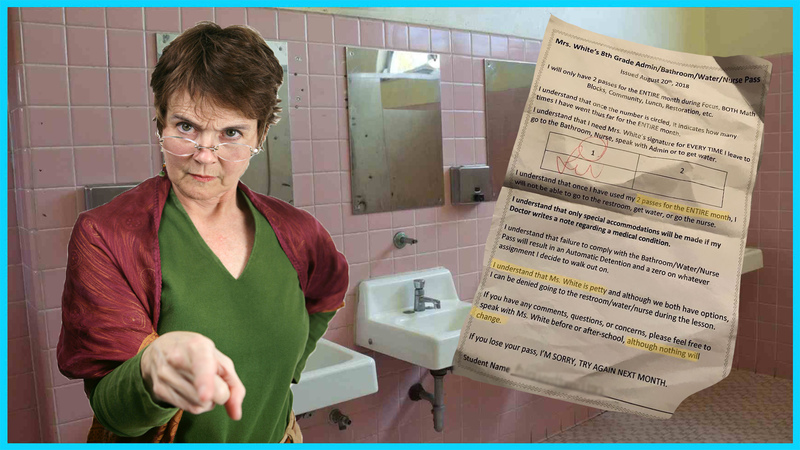 The document requires Mrs. White’s signature every time a student leaves the classroom to go the bathroom, nurse, or get water. It stipulates that each student only gets two such breaks per month. After that, if a student leaves the class, they get an automatic zero on an assignment or detention. The document was initially posted by a parent to Facebook, but has since been taken down, but a friend of the original poster saw it and put it on Twitter, where it went viral. The most common reaction was outrage! Other commenters pointed out the painful consequences of being denied a necessary trip to the bathroom or nurse’s office. The school’s superintendent, Dr. Nickalous Manning, put a quick end to any speculation that the hall pass is approved by the school. 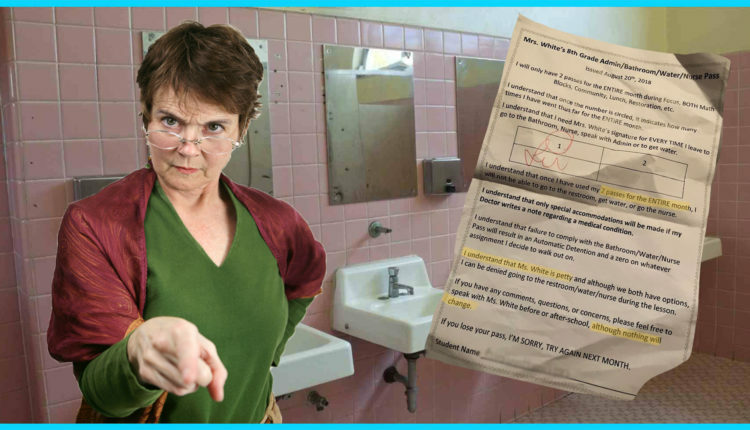 The school sent out a message to parents assuring them that the hall pass is inconsistent with their values and that student safety is a top priority, but several commenters think that doesn’t go far enough and think Mrs. White should face disciplinary action. Now, just for a second, let’s try and see this from the teacher’s point of view. Maybe this classroom is in complete disarray, students constantly leaving the classroom to do whippets or trade pogs or whatever I assume middle school kids do these days, and she’s just trying to maintain a little bit of order – keep the inmates from running the asylum, so to speak. Well, not many people online agree with that assessment, but there are at least a few commenters who think maybe the firestorm surrounding the hall pass is overblown. None of the schools comments mentioned any disciplinary action taken against Mrs. White. So as far as we know, she’s still teaching, though her students are allowed to go to the bathroom as much as they want. What do you guys think? Is there any explanation for Mrs. White’s letter? Let us know in the comments or on Twitter at @WhatsTrending. VIDEO: Is Elon Musk Smoking Weed on Joe Rogan’s Podcast a BIG DEAL?